Keynsham’s striking new civic centre and the innovative Lee Centre at Bath’s Ralph Allen School have been named among the region’s best new buildings by RICS (the Royal Institution of Chartered Surveyors). They appear on the shortlist for the annual RICS South West Awards, putting them head to head with major new schemes such as Bristol Airport’s expansion and the National Composites Centre on the Bristol & Bath Science Park, as well as pioneering regenerations projects across the region. Designed by Feilden Fowles, the Lee Centre, pictured below, built with cross-laminated timber cladded with sweet-chestnut and partly embedded in the landscape, has already won a national RIBA (Royal Institute of British Architects) award and qualified for the Stirling Prize long list. The centre, which focuses on science teaching, was also being named among the best 50 buildings in Britain in 2014. 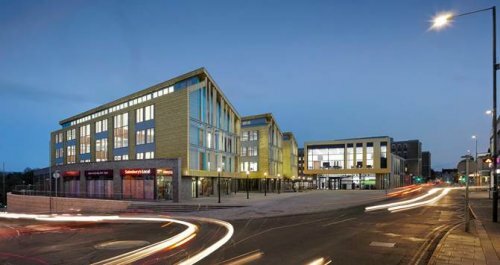 The £34m, 20,000 sq ft Keynsham civic centre, pictured right, incorporates Bath & North East Somerset Council’s offices, offices for the police and Sirona Care and Health, a new library and retail units. 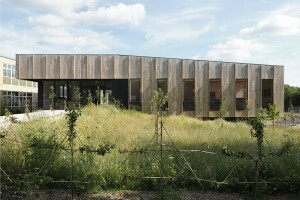 It was designed by the Bristol office of global architects Aedas. Local blue lias stone was used, while the offices above are clad in standing seam brass to reflect the town’s historic involvement in the brass industry. Eight category winners and a Project of the Year will be selected from the 42 shortlisted entries to the awards. The winners from the Building Conservation, Community Benefit, Infrastructure, Design through Innovation and the Regeneration categories will then be invited to represent The South West and compete against projects from across the rest of the UK, at the overall RICS Awards in London. The 2014 South West Project of the Year title went to Porthmeor Artists’ Studios and Fisherman’s Cellars. Judging for the awards will take place during spring 2015 with the RICS South West Awards ceremony being held at the spectacular Bristol Marriott Hotel on Thursday 21 May. Hosting the South West Awards is BBC presenter Alex Lovell. The RICS Awards UK national ceremony will take place in London in October 2015. The RICS South West Awards 2015 showcase the most inspirational regional initiatives and developments in land, property, construction and the environment, celebrating the achievements of professionals working in both the built and natural environment.